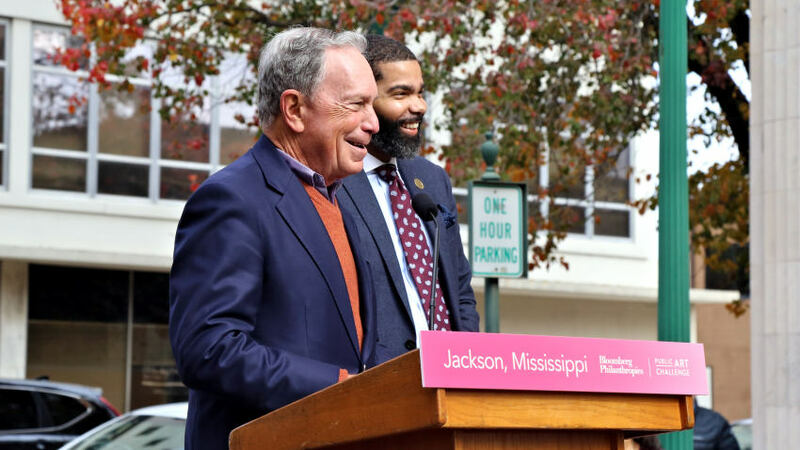 Jackson Mayor Chokwe Lumumba looks on as former New York City Mayor Michael Bloomberg speaks at today's press conference..
Jackson Mayor Chokwe Lumumba speaks about the Bloomberg Art grant at today's downtown press conference..
Jackson Mayor Chokwe Lumumba and former New York City Mayor Michael Bloomberg share a laugh at today's press conference. 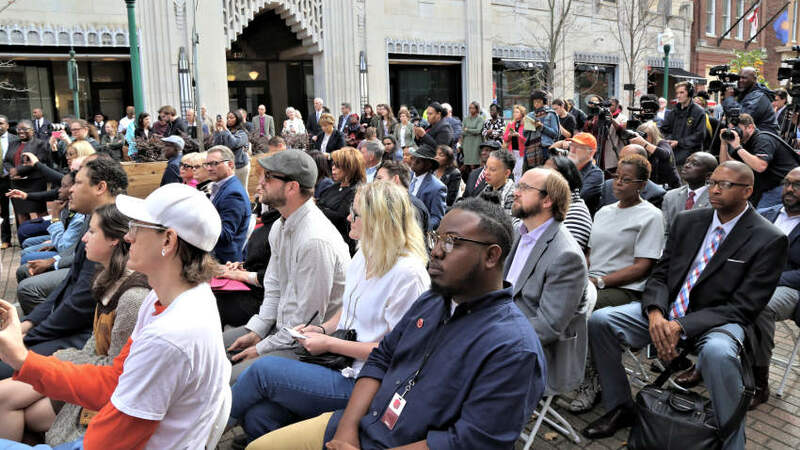 A large crowd, including project artists like Roderick Red (center foreground) and Scott Allen (wearing the flat cap) attended today's event. 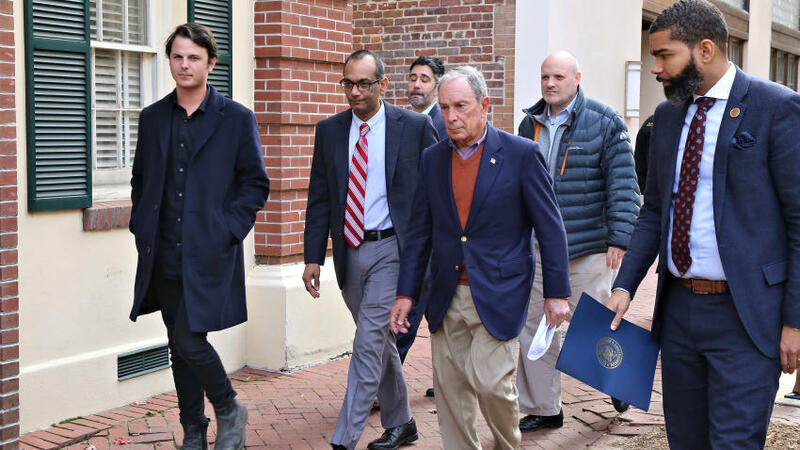 City of Jackson Planning Division's Travis Crabtree, Planning Director Dr. Mukesh Kumar, Bloomberg and Lumumba walking to today's event. 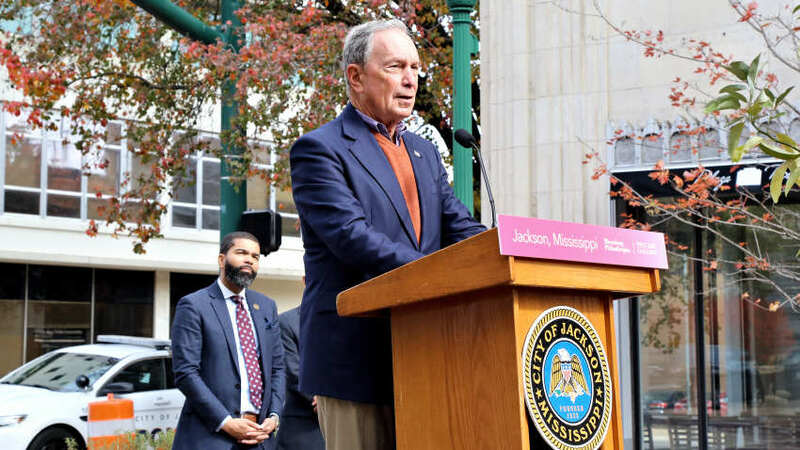 The City of Jackson has been chosen a Bloomberg Philanthropies 2018 Public Art Challenge recipient, one of three out of two hundred applicants from across the country. 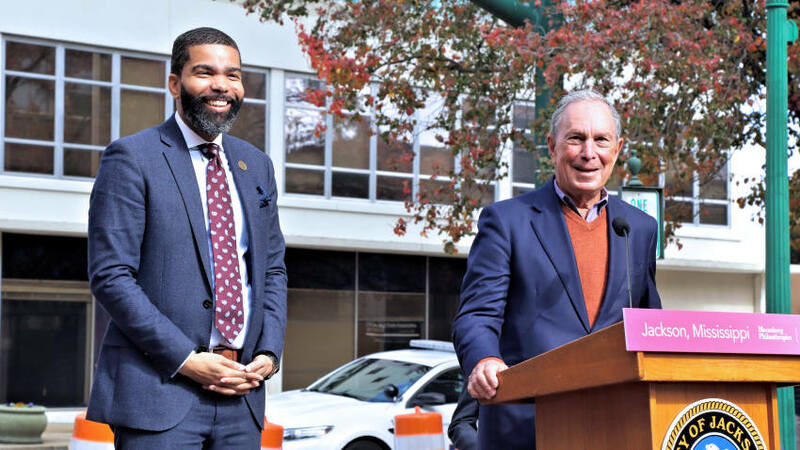 Former New York City mayor, public health advocate and philanthropist Michael Bloomberg was in town to personally make the announcement at a press conference on Congress Street. The grant will be used to fund “Fertile Ground,” the submitted project that brings together an interdisciplinary team of artists, chefs, filmmakers and others to create city-wide exhibitions that aim to inform policy related to nutrition. “If we want to build that radical city that I believe we will become, we have to ensure we have healthy citizens,” he added. Mayor Bloomberg, commenting on the parklet where the press conference was being held, noted its subtle but meaningful role in making the city better. Bloomberg cited examples from Detroit, New York and the recent Paris Climate Summit where artists have contributed “powerful messages” through public art. Participating partners include Jackson Medical Foundation, the W.K. Kellogg Foundation, Jackson State University and the Mississippi Museum of Art. Adrienne Domnick, a local artist whose work is an exploration of sound, light, bold colors on a variety of surfaces. Award-winning filmmaker, director, and producer Keegan Kuhn, and local director and producer Roderick Red, who both work with nonprofits and focus on social issues. Nick Wallace, included on 2017’s “Best Chefs America” list and the Mississippi’s first Food Network’s “Chopped Champion,” is a leader in redefining the Southern food experience and also provides healthy food options for local schools. 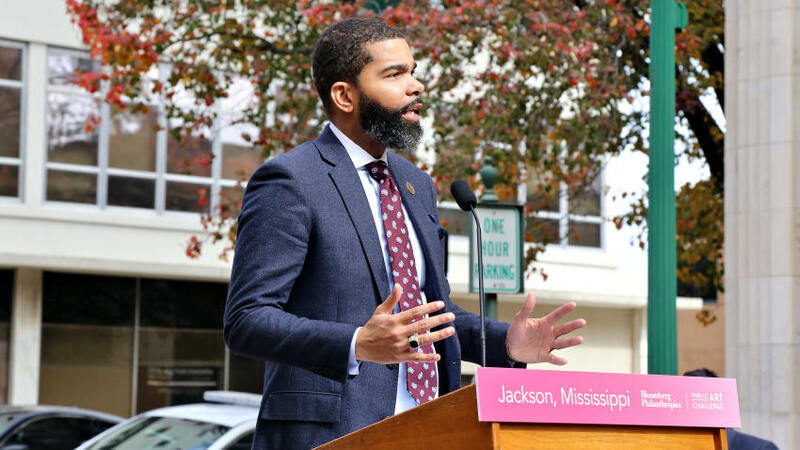 Special recognition was also given to Jackson’s Planning and Development Division – specifically long-range urban planners Travis Crabtree and Salam Rida – who discovered and initially applied for the grant.